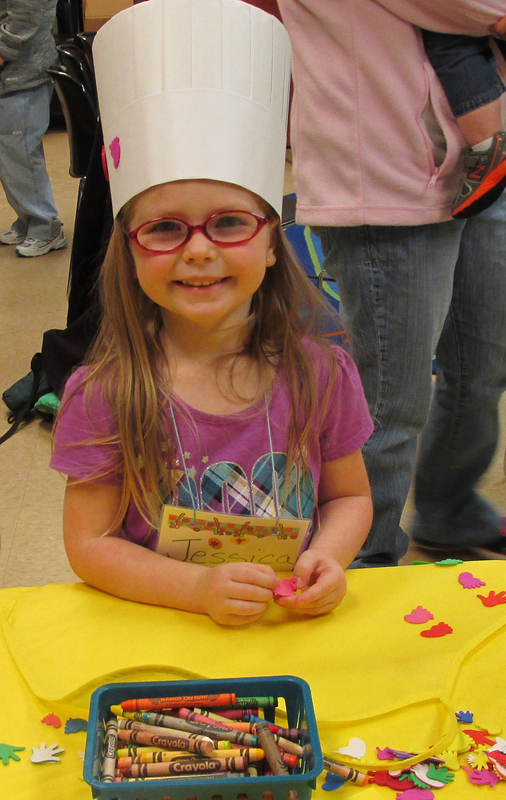 Four-year-old Jessica Targgart models the chef’s hat she made during Preschool Story Time at the North Webster Community Public Library. NORTH WEBSTER — Get a sneak preview of spring fashions at the Big Deal Reveal Fashion Show sponsored by the library at 1:30 p.m. Sunday, March 13. The event will take place in the North Webster Community Center Banquet Hall where Gypsy Jacks Fashions will present their spring line-up of original fashions and accessories for ladies and children. Each piece is uniquely designed and created by Jackie Bontrager of Goshen and will be modeled by area ladies. Babies and their parents will be having fun during lapsit at 11 a.m. every Tuesday morning as staff introduces our youngest patrons to books and stories. Parents also learn how to engage their children in meaningful play and receive information on early literacy development. Lapsit is for infants up to 24 months. Older children, ages 5 to 12, engage in meaningful play at LEGO Club from 1-2:30 p.m. Saturday, March 12, as they learn problem solving, critical thinking, and fine motor development while having a fun time building with LEGOs. LEGO Club meets the second Saturday each month and provides an opportunity for parents and kids to spend quality time together in fun activity. If you don’t have a computer or internet access, the library has a bank of public computers available for free use. You don’t even need a library card to use them. Just ask for a password at the circulation desk. We also have free Wi-Fi for laptop and mobile device users. So if you want to e-file your taxes online, apply for government benefits, research a topic, check your e-mail, post on your Facebook page, shop online, or simply browse the web for fun, you can do it all from the library.